A surprised Father Christmas was thrown out of a multinational corporation’s AGM in London today after presenting the Chairman with a stocking full of coal. Santa Claus was frogmarched out by irate security at the prestigious meeting of GCM Resources, a controversial multinational corporation whose coal mine plans suffered angry condemnation by UN Special Rapporteurs this February. UN experts warned of “irreversible damage” to ecosystems and 50,000 evictions of indigenous people at the coal mine site in Phulbari, Bangladesh. Livid security pulled Santa from the stage and threw him out of the Insitute of Directors. Santa was last seen looking flustered with his beard at an angle, running haphazardly away from the AGM to a bicycle to make his getaway. It is not known whether Father Christmas will recover in time for the yearly gift-giving on Christmas Eve. Environmental activist Ashley Feils was evicted from the GCM Resources AGM after presenting chairman Gerard Holden with a stocking full of coal. Photo Credit: Anonymous. Where now for GCM Resources’ controversial mining project in Bangladesh, after a protestor dressed as Santa Claus stormed the company’s pre-Christmas AGM and deposited a stocking full of coal in the lap of chairman Gerard Holden? It seems the Aim-listed miner has already shrugged off the scenes of the St Nicholas imposter – 19-year-old grass-roots activist Ashley Feils of the Climate Justice Collective – being frogmarched out of the meeting at the Institute of Directors. A spokesman says GCM Resources is still “very committed” to getting the project approved, and plans to meet Bangladeshi prime minister Sheikh Hasina “as soon as possible” to discuss how the project can address the country’s energy needs. The groups opposing the mine say the Phulbari Coal Project could displace 220,000 people. Not so, responds GCM, which claims 40,000 people will be resettled over 10 years, and that 17,000 new jobs will be created as the open-pit coal project develops. “We welcome the opportunity to speak in a constructive dialogue with any group, but have not yet been taken up on this offer,” says GCM, which has reassured shareholders it is “aware” of their frustration. Demo goes fantastically well by passionate protesters chanting slogans. Photo Credit: Samarendra Das. Foil Vedenta (20/12/2012) – From Phulbari to Niyamgiri! These links will also be posted on our News and Resources Pages. Thursday was a miserable day for the board of GCM Resources, and a day, of what the protesters of the destructive Phulbari Project called ‘ the day for Phulbari Resistance’. 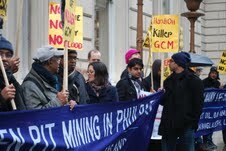 Despite the heavy, grey and wet weather in London, protesters of the Phulbari Coal Project and transnational activists of climate justice and environment in London started to gather from 10am sharp at the Institute of Directors, where the Annual General Meeting of GCM Resources plc, was scheduled to take place. They were as creative as powerful in their protest against the investors and shareholders of GCM Resources. The event kicked off by chanting slogans, ‘Out out out, GCM out of Bangladesh’, ‘blockade GCM, blockade the bloodsuckers’. It ended by chanting bangla slogans, Duniar majdur, ek hou juddho koro’. The event was organized by the UK branch of National Committee to Protect Oil-Gas-Mineral Resources and Port-Power of Bangladesh (‘UK Committee’) with the support of Phulbari Solidarity Group and several other environmental and human rights organizations based in London. Activists from one such organisation, Agitartworks, put on an amusing street-theatre in which activists dressed as GCM executives acted out the repression which the people of Phulbari would face if the mine goes ahead. Activists blocked the entrance to the Institute of Directors (IoD) front door by dumping coal in the doorway. They were to lock out the investors of GCM. But, desolately, the police were more interested in detaining the activistsand actors, than tackling the real crimes being discussed inside by GCM executives and investors. Two of the activists, who played a wonderful performance in featuring how abusive and violent GCM Resources is, were arrested and more armed police arrived by police van to intimidate the remainder of the protesters. But more was to come, and many more joined the protest at the post-theatre phase. The demo took more powerful and organised look after the arrests of the two activists. Angry activists chanted Bangla slogan, the slogans that were borrowed from Phulbari, ‘Bosot vita dhongso kore koila khoni hobena; masjid-mandir dhongsho kore koila khoni hobena; tomar bari amar bari Phulbari Phulbari’. Akhter Sobhan Khan Masroor, Member Secretary of the UK Committee, welcomed the demonstrators and invited to give speeches. There were speeches by representatives of the groups involved in the action, and a memorandum from the demo to the British Prime Minister was read out.There was anger at the involvement of the British Government in support for GCM Resources’ attempts to push forward the Phulbari project. Concerned voices, chanting slogans ‘shame, shame on GCM and this government’, were many. An Eviction Notice to GCM was to have been handed over to the company, but the presence of armed police prevented demonstrators from entering the building –‘ it will therefore be delivered to the company by post’, says Rumana Hashem. The demo ended with a vote of thanks from the Convenor of the Committee in UK. Meanwhile, inside the meeting of GCM, activists from the Bangladeshi community, Climate Justice Collective, Corporate Watch, and World Development Movement led by Richard Solly of London Mining Network, grilled the board on the contentious project and its catastrophic human rights impacts. And to top the morning off, back inside as the meeting was drawing to a close, GCM’s board had a surprise seasonal visitor, as an anonymous activist dressed as Santa Claus presented a stocking full of coal to company chairman, Gerald Holden. He entered the room saying, “Ho, ho, ho, have you been naughty or nice this year? This year you threatened to evict 220,000 people so you could profit from polluting the climate. St Nick always knows – your stocking’s full of coal!” Then he dumped a sack of coal over the desk on which the board was sitting. The meeting was quickly broken up following the intervention from Santa. In London yesterday, GCM’s share price had already taken a dramatic tumble by the time executives and investors arrived at the AGM, following the publication of an article in the Daily Mail highlighting an on-going relationship between UK government officials and the company. The London-based and AIM-listed mining company, GCM Resources had already had a scandal for the killing of three people in the North-west of Bangladesh, Phulbari, and the continued human rights violation since 2006. Supported and financed by global hedge fund and banks including UBS, Credit Suisse, LR Global, and Argos Greater Europe Fund, the company is aggressively moving on to implement an immense open pit coal mine in the region, ignoring the human rights and environmental degradation the project would leave. If the project went ahead, it would turn 14,500 acres of land into a giant hole in the ground, displacing almost 130,000 people. As the coal is so deep, huge amounts of water would have to be extracted from the surrounding area, affecting the water supply of 220,000 people. Following local, national and transnational resistance to the project for the last six years, a couple of investors including Barclays pulled out of the project, and the UK government distanced itself from it. But a change of personnel at the company earlier this year has seen renewed efforts by GCM to push the mine forward. In October 2012, the government of Bangladesh instructed local administrators to cooperate with Asia energy, the Bangladesh subsidiary of GCM’s surveys in Phulbari, attempting to quash opposition by banning gatherings of more than five people. In response, activists and communities against the mine called a two-day general strike, with further protest planned if demands to expel GCM from the country and ban open-cast mining are not met by 31 December. The protest in London was held to express solidarity with the people in Phulbari and to strengthen the power of resistance against the proposed Phulbari Coal Project of GCM Resources. There is no doubt that the GCM shareholders are left with much confusion by the level of resistance to the mine in both Bangladesh and the UK. These links are also available on our News and Resources Pages. Yesterday was nearly the shortest day, and the weather in London was heavy, grey and wet, and inside the GCM Resources AGM everyone felt gloomy. Company Chairman Gerard Holden had a cold, but hoped his voice would hold out till the end of the meeting. A number of shareholders clearly felt gloomy about the prospects of the company ever getting permission from the Government of Bangladesh to go ahead with its proposed Phulbari coal mine, and were worried that there were things the company was not telling them. Others – people from London Mining Network, World Development Movement and our friends – felt gloomy about what would happen if the mine does go ahead. The only bit of seasonal cheer was delivered right at the end, when Father Christmas arrived, courtesy (apparently) of the Climate Justice Collective – but more of that in the report below. Director Steve Dattels, up for re-election, was not there. That may have been wise, given the questions raised by the continuing scandal in Namibia over the sale of assets by Uramin, another company that Mr Dattels was involved with. But nobody mentioned that. There was plenty of criticism of the company, however, over the potential impacts of the Phulbari mine. And the answers given by both Gerard Holden and Executive Director Gary Lye painted a picture of paradise on earth. If only the pesky locals and their political allies would wise up, accept the enlightened western vision of progress and drop their absurd objections to the mining project, everything would be better for everyone – more houses, more water, more crops, more electricity, more jobs, more money. What they seemed unwilling to address was what happens if, despite the fact that the company has explained the supposed merits of the project, local people still don’t want it – partly because they don’t believe the company’s assurances (and why should they, given the track record of the mining industry elsewhere?) and partly because they feel an attachment to their land and way of life (and why shouldn’t they?) and don’t want them to disappear down an enormous hole in the ground. And local people, in enormous numbers, have been making clear for years that they don’t want the project. What part of “No” does GCM not understand? To date, local people’s expressions of dissent have been met by armed repression by State forces. Does GCM really want to press ahead with this project at the cost of continued violence? Why not just cut their losses and leave? Reportage below is in normal type; commentary in italics. After a brief introduction, during which he suggested that general questions be left until the end of the meeting, Gerard Holden called for a vote to accept the company’s Annual Report and Accounts. I pointed out that shareholders could hardly be expected to vote on the report without having a chance to ask questions on it. So Mr Holden called for questions. I asked about access to water. I said that Catarina de Albuquerque, the UN Special Rapporteur on the human right to safe drinking water and sanitation, has stated that “Access to safe drinking water for some 220,000 people is at stake,” at Phulbari. The water table may be lowered by 15-25 metres over the life span of the mine over an area extending some kilometres beyond the mine site. Page 4 of the company’s Annual Report, Poised to Deliver, says that “overall water quality and availability for people in the affected area will be improved.” I asked the company to explain how. Gerard Holden said that the mine site is in an aquifer running from the Himalayas to the coast. This is similar to the situation around Cologne in German, so GCM sought advice from a mining company there on management and modelling of water flows. The German company, RWE Power International, is the water consultant for the project (the source for this is ‘International Advisers and Consultants’ for the project on GCM’s website. Gerard Holden said that the UN Special Rapporteur had drawn her information from the public domain and had excluded information based on fact, engineering or modelling. In fact, information was drawn from the Final 2006 Report of the Expert Committee formed by the Government of Bangladesh to assess the proposed project.GCM had offered this information and it had been declined. The UN Rapporteurs had not visited the site. Executive Director Gary Lye added that the UN had not checked the facts and that the company had given them the water management plan. It would be necessary to extract water from the mine pit but GCM would deliver much of this water to the nearby township as tap water. At present, people have to pump water out of the ground but do not have electricity for pumping. Experts are concerned about the risk of desertification in northwest Bangladesh. Roughly 30% of the tube wells used to access water are already inoperable during the dry season as a result of declining groundwater resources and nearly half of all people in Phulbari report that they do not currently have enough water to meet their needs. Gerard Holden said that GCM will deliver water for domestic, agricultural and industrial use. One third of the water withdrawn from the pit will go back into the ground. The mine will be surrounded by bore holes and about one third of the water extracted from the pit will go back into the ground, ensuring more water is available in the areas where it is reinserted, and maintaining the water supply. Gerard Holden was dismissive. The company was aware of the criticisms of various groups but these groups refused to engage with the company to discuss these concerns. John McDonnell MP had not bothered to get the company’s side of the story. Rose Collins, an independent shareholder who said that she was from Guyana, said that water is a problem in all tropical areas and asked whether the mine would create problems of arsenic contamination. Gary Lye replied that water in the area had been tested by the company’s experts and that there is no arsenic in the water in that part of Bangladesh. He suggested that the potential for the mine creating an arsenic contamination problem was low. Gerard Holden added that the company had done a “massive suite of tests” on air and water quality and that one of their plans was to distribute water if the monsoon fails. Of course, monsoon failure may become ever more likely as climate change deepens – climate change for which the burning of coal bears a disproportionate responsibility. Ruth London asked about food security for displaced families. The Phulbari area is very fertile and not subject to flooding. At least 40,000 people will be removed from their land and will not receive land in compensation. She asked about the impacts on nutrition and health, on carers – mostly women – for those who became sick, and about funeral costs and compensation for grieving families. Given the concerns expressed by the UN Rapporteurs and by local people, and given the wider ranging impacts on food stocks in Bangladesh and on climate change, which particularly affects Bangladesh’s low lying flooded areas, how could the company persist with its plans? Gerard Holden replied that a certain amount of land would indeed be permanently removed from use as a result of the project but that other land would be rehabilitated. The waste dump would be rehabilitated and forested. The plan is to have a continuous process of rehabilitation. The German mining company in Cologne has allowed the quality of the land to be improved, leading to better crop yields. Local people around Phulbari do not have decent fertiliser or seed quality, so GCM will improve them and thus enable an extra crop-growing season. This would allow local people to produce more food in a more refined way, partly by giving them much more water. Ruth said that the directors of GCM might feel unhappy if their own homes were to be continually rehabilitated and they themselves were forcibly removed. She said that local people do not necessarily have the same view of what is good for them and their land as the company has. Rose Collins intervened at this point. She said she hoped the company would be considerate. US companies had dug out bauxite in Guyana, destroyed forests and left people with nothing but great holes in the ground. Gerard Holden replied that companies could not behave that way any longer. GCM was not looking to destroy Phulbari but would invest hundreds of millions of dollars to build mosques, community centres and other facilities. He did not mention the fact that GCM intends to destroy or move 138 mosques, temples and churches, 692 graveyards, and 2 ancient archaeological sites. Ruth expressed doubt that this would actually occur, given the record of other such mining projects. Gerard Holden replied that the company knows what it is doing. Roger Moody, who in 2008 made a study of the mine’s potential impacts, and the Government of Bangladesh’s Expert Committee, disagree – both expressed concerns about the company’s complete lack of prior experience with mining as a company (individual board members have experience but GCM does not). Among other things, said Mr Holden, the company would create forest land by planting hard wood, soft wood and fruit trees. Gary Lye added that the company’s resettlement plan is not their own. He said that the IFC guidelines include consultation. He said that you build consultation from the ground up. The details of people’s choices are built into the plan Page 4 of the Annual Report talks about the Resettlement Plan, which is dynamic and based on people’s wishes. He said that about one third of the people in the town live in the eastern part of the town and want compensation so that they can leave – although, he added, international standards mean that the company is supposed to monitor their wellbeing. Two thirds of the current town’s inhabitants want to move to the new town. Of the rural families, one quarter want to give up farming and go, because production costs mean they cannot make a reasonable living any more. Most of the farmers are sharecroppers and have to give part of their income to the landowner. GCM will have income generating programmes and will train people and offer preferential employment. Gerard Holden said that a number of villages in the area are inhabited by “’Indigenous Peoples’ in inverted commas.” He said that the people in these villages are visibly different from the majority of the population but that they are not indigenous to the area, having been pushed into it from elsewhere, and they are very poor. The Government of Bangladesh denies that there are Indigenous Peoples in the country. The Bangladesh Supreme Court has issued a ‘Show Cause’ notice to the Government to explain how it reached such a conclusion. By using the term ‘in inverted commas’, the Chairman associated himself with the Government view – a view strenuously challenged by Indigenous Peoples’ organisations in Bangladesh. The consultant who did the anthropological research for the Indigenous Peoples’ Development Plan said that they trace their ancestry in the region back 5,000 years. Mr Holden said that GCM had done a lot in its Environmental and Social Impact Assessment to find out what the people want and to protect their livelihoods. He said that the company comes from the industry perspective of accepting Free Prior Informed Consultation but does not believe in the need for Free Prior Informed Consent, as this could mean that one individual could hold everyone else to ransom. This shows both a complete misunderstanding of the varied ways in which different Indigenous Peoples discuss and decide on matters of concern, and a rejection of the United Nations Declaration on the Rights of Indigenous Peoples, which explicitly recognises Indigenous Peoples right to Free, Prior Informed Consent, rather than consultation. The right to consent does recognise Indigenous Peoples’ right, as Peoples, to say no to development projects on their land. It does not give such a right to individual members of an Indigenous People. Mr Holden said that the company knew all about the conflicts in communities – who does not like whom, about family disputes back at least a hundred years. I found this comment rather sinister: why does the company have such detailed knowledge of Indigenous communities’ internal dynamics, and what does it intend to use it for? Gary Lye added that the company believes that there are 2300 indigenous peoples in the project area, mostly in the south eastern part of it, so they will not be affected for many years. These people want to move closer to the Roman Catholic mission to the south east of them. He said that GCM takes the plight of less advantaged people very seriously. The company’s Indigenous Peoples Development Plan has been given to activist groups in Bangladesh. The company is on top of looking after these people through consultation. Gary Lye went on to say that there are landless people in the area and that the company will look after them as if they had land title (meaning that both those with and without title will become landless. The company’s Draft Resettlement Plan baldly states that “Large tracts of cultivation land will be acquired and most households will become landless.”) Mr Lye said that there is a lot of scaremongering. Landless people work mostly in the timber industry. A lot of propaganda has been spread to cause these people fear. The company recognises that landless people live there, that many are indigenous people, and that they therefore feel twice threatened. But the company, he said, will improve their lives. Gerard Holden said that people will be compensated with money, housing and new crop allocations. Nobody will be worse off as a result of the company’s plans. Jake said that the company was judging by its own standards. Communities would be broken up and the ecology affected. Local people may not agree that this is an improvement. Gerard Holden said that the company had gone to a great deal of trouble to find out what each family wants and to fulfil it. The mine is a long-term project and the company does not want people being significantly unhappy. He asked why the company would wish to do that. Jake said that the company’s bottom line was profit. Gerard Holden responded that this was not the company’s only goal, as it had other obligations as well. The Chairman then brought questions on the Annual report to a close and moved to the resolutions, all of which were passed. Nobody asked any questions or offered any comments. The Chairman then closed the formal part of the meeting. He then read out the following statement. “As detailed in the Company’s 2012 Annual Report, we have been pursuing approval of the Phulbari Coal Project by engaging directly with the Government of Bangladesh as well as developing and enhancing relations with the local community. “Over the last nine months we have met with all the appropriate Government officials and potential coal customers in Bangladesh and are currently seeking an audience with Prime Minister Sheikh Hasina, in her capacity as Minister for Power, Energy and Natural Resources. “In the Dinajpur region, where Phulbari is located, the Company continues to open up new channels of communication with the local community. Focus group discussions and agriculture improvement workshops with farmers have taken place across the Project area, and surveys are nearing completion with the support of both the local administration and the Home Ministry. We are committed to carrying out meaningful, culturally appropriate consultation with potentially affected people prior to development of the Project. “We are also committed to developing the Project to the highest international and national environmental and social standards. To that end we engaged international consultants Environmental Resource Management to review the Project’s Environmental and Social Impact Assessment in light of the new performance standards released by the International Finance Corporation. Those “gaps” identified will be addressed in the coming months. “We understand from press reports today that complaints have been made about the development of the Phulbari Project to the OECD. We have not received any OECD complaint and this is the first we have heard of it. It is therefore hard to comment on the substance of this allegation. We stated at our AGM last year that we were available to meet with any group interested in a constructive dialogue and to discuss their concern but no group has taken us up on this offer. We would therefore welcome the opportunity this process would provide to discuss the project and respond to the allegations and incorrect information being circulated. “We are committed to developing the project and managing its social and environmental impacts to the highest international standards. Not only will the project address Bangladesh’s energy needs, it will also deliver significant benefits for the local community. These include an estimated 17,000 new jobs, improved living conditions and livelihoods for project affected people with approximately 40,000 progressively resettled as the mine develops (as opposed to the figure of 222,000 suggested); abundant high quality water for irrigation and drinking, and expected increased agricultural production from the excavated land which will be progressively rehabilitated. “Over the last 12 months the Company’s financial resources have been significantly impacted by the fall in share prices of the investments held, in line with other junior mining companies. However we continue to have sufficient resources for the foreseeable future. GCM is in discussions to obtain further equity funding while management are undertaking a thorough review of operating costs. “The share price of GCM has fallen substantially since the last Annual General Meeting and we are aware of the frustration felt by shareholders. We believe the fall in share price can mainly be attributed to the sale of shares by a large investor who are rebalancing their portfolio, and certainly does not reflect the progress we feel has been made in pursuing approval. He then invited general questions. One shareholder asked him if the company would get project approval before the next election in Bangladesh. Gerard Holden said it would. The shareholder asked what had changed in Bangladesh to give him this confidence. Gerard Holden said that communication with members of the Government of Bangladesh had improved significantly over the past two months. The shareholder said that the press in Bangladesh is controlled by Anu Muhammad’s group. The company kept inviting them to come to them to enter into dialogue, but would it not be better to go to the group and dialogue with them? Gerard Holden replied that the media in Bangladesh is controlled by a number of different factions. Gary Lye and his team have spent a huge amount of time talking to the media but some editors would never change their views. Gary has often been on local television talking about how the Phulbari project will impact positively on Bangladesh. The Home Minister and others have been very supportive of the project. The shareholder asked if there had been an open commitment from the Prime Minister or other ministers that the project would go forward. Gerard Holden answered that the Prime Minister and other ministers had not stopped the project. He said that the Energy Advisor has his own agenda and that GCM “would not play his game.” He had brought the country to its knees. GCM is working around the Energy Advisor in many ways. He is an advisor, not a minister. He is under huge pressure for what he has done with rental power stations. He may be forced to resign because people do not have electricity. A shareholder said that the Chairman seemed very confident that the company would get project approval before the election. In an election year, something which has a lot of political opposition would be a risk for the party in government to approve prior to an election. He asked how much cash the company had, and how long it could continue without raising more cash. Gerard Holden said that the company had cash up to June 2014, six months after the next election. The company is in discussion with people who may bring new cash to the project. He said he could not go into further detail. The shareholder asked again whether the company could be confident that it would get approval before the election. Gerard Holden said that the company was working flat out to get approval but that it relies on the Prime Minister. He said that he could not give specific reasons why he was confident. The shareholder said that shareholders need more information than this. He said there had been a void in communication with shareholders over the past year. Gerard Holden said that he could not put out rumours until the scheme of development had been signed off. Gerard Holden replied that the company is working very hard to get project approval before the election and that the shareholders would be the first to know once it had been achieved. Another shareholder said that there was a lot of material in the press about the Government’s coal policy. The Government wanted further studies on the water table and had apparently hired the same company that had done the original study for GCM. Gary Lye said that the Government’s Technical Committee had released its report to the media. The Committee works within the Energy Ministry and the report has not been handed over. Underground mining is not appropriate at Phulbari. Barapukuria is struggling and unsafe. It produces less than one million tonnes of coal a year and there is ground subsidence. The management at Barapukuria would love to do open pit mining. They know that they have to do studies. They have engaged technical experts to undertake a water modelling study, but the experts employed are good on flooding issues and not on ground water studies. The Government is doing what it must do. Under Bangladeshi law, the project proponent must do studies, produce a report and wait for a decision. That is what GCM has done. The shareholder said that press reports had spoken of the Chinese company managing Barapukuria wanting to mine at Phulbari. Gary Lye said that there was a lot of media hype about this. One part of the Energy Ministry would like to get into mining and would like Phulbari, but nobody had approached GCM about this. Rose Collins asked if the company had any thoughts about renewables. She had travelled through Germany and was amazed at their use of renewables. Gerard Holden said that the German Government had brought in new laws which increased everybody’s electricity bills to pay for the rollout of solar energy. This caused chaos for people in the cloudy parts of Germany. It was funded by consumers. Rose asked if the Board had any plans to use renewables. Gerard Holden said that some mining companies have put solar in place to power their operations but that this would take up even more land if they were to do it at Phulbari. GCM had thought about using both wind and solar for electricity generation for the mine. Another shareholder stood up and congratulated the company for all that it was doing and said that the company was about to receive a reward from someone who needed no introduction. At this point, a man dressed up as Father Christmas burst in to the room through a door behind the table at which the Board was sitting and asked the Board whether or not they had been naughty. Suggesting that in fact they had been, because of the potential impact of their plans at Phulbari, he emptied a small sack of coal over the table at which they were sitting. The room then became quite active and it became difficult to note all that was being said. Security personnel moved swiftly to expel Father Christmas. Several shareholders stood up and confronted the shareholder who had introduced the award, accusing him of not listening to the company and not knowing what he was talking about. He responded by saying that the company’s plans at Phulbari were outrageous. The Board stood up and some began to leave the room. The meeting ended in chaos. GCM AGM 2012: From Phulbari to Niyamgiri! Activists from Foil Vedanta joined the Bangladeshi community and other organisations today at the AGM of GCM Resources – the UK based mining company who want to displace 220,000 people for a giant open cast coal mine in Phulbari, Bangladesh. As 40 protesters shouted slogans outside the Institute of Directors (IoD) where the AGM was being held, another group of activists blocked the entrance to the building by dumping coal in the doorway. Inside the AGM one activist dressed as Santa gave company chairman Gerard Howell a present of a stocking of coal. Police push an activist away from dumping coal on a woman as part of a street theatre. They believed they really were GCM execs! At the same time inside the AGM an activist dressed as santa from Climate Justice Collective gave a stocking full of coal to the company chairman saying ‘you’ve been naughty this year’. The meeting was totally disrupted by activists from the Bangladeshi community and other organisations including World Development Movement and London Mining Network asking questions about the highly contentious Phulbari project. Foil Vedanta members gave speeches calling for solidarity between movements against mining companies and other corporations looting South Asia’s resources while benefitting from a cloak of London respectability. Seven Special Rapporteurs of the United Nations issued a joint UN press release on 28 February, 2012, calling for an immediate halt to the project on the grounds that it threatens the fundamental human rights of hundreds of thousands of people, including entire villages of indigenous people, and poses “an immediate threat to safety and standards of living.” ? ?GCM Resources plc, an AIM-listed UK-based multinational company, is moving to implement the project despite the human rights and environmental concerns that have been raised. We declare solidarity with those affected and fighting in Bangladesh. From Niyamgiri to Phulbari – we will not allow these companies to loot precious lands in the name of development!! !